Frank Kingdon Ward (sometimes written Frank Kingdon-Ward) is often referred to as the last of the great plant hunters. Over a period of 45 years (1911-1956) he made 22 expeditions, mainly to Burma, Tibet and China (Yunnan and Szechuan) in search of new plants. He wrote 14 books about his travels, the first of them (Land of the Blue Poppy) recording the many dangers that he faced during his first (and possibly most adventurous) trip to the mountains of Burma, Yunnan and Tibet in 1911. The Blue Poppy refers to the sky-blue flowers of Meconopsis betonicifolia, which grows at altitudes of 4000-5000 m in Tibet and Yunnan. Sadly, this beautiful blue poppy does not take kindly to Victoria’s hot summer weather but seems to thrive in Christchurch and Dunedin in New Zealand’s much cooler South Island. Over the years Kingdon Ward collected plants for several different employers, nurseries, syndicates of wealthy gardeners, and the Royal Horticultural Society. Mostly he collected high-altitude plants suitable for outdoor cultivation in England, Wales and Scotland. He collected many new rhododendron species, including the lovely yellow-flowered Rhododendron wardii. A few notable plant introductions (among the horde of plants that he found) were the brilliant yellow Primula florindae (named after his first wife, Florinda), Cotoneaster conspicuus and Lilium mackliniae (named after his much younger second wife, Jean Macklin, who accompanied him on several excursions). Kingdon Ward found relatively few epiphytic orchids during his travels, mainly because his excursions centred on mountainous areas where all of the native orchids were terrestrial. 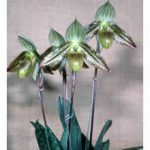 However, in 1922, while crossing a mountainous area of Northern Burma (now Myanmar) on his return from an expedition to China, he collected a single paphiopedilum plant in flower. Unfortunately, it was lost during the following weeks of the trek. However, Ward vividly remembered its beautiful chocolate-coloured flower and the general location where it grew, and was determined to find more plants. Although he continued to search for the lost slipper whenever he passed through the region, it wasn’t until November 1931 that he found a number of flowering plants spread over a wide area. They were collected on his return journey and shipped to England where the first of them flowered in 1932. 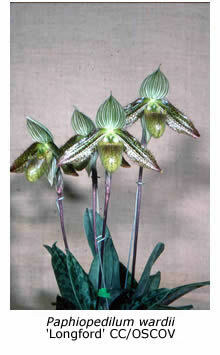 The British taxonomist Summerhayes then named the species Cypripedium (now Paphiopedilum) wardii in honour of its discoverer. Paphiopedilum wardii remained extremely rare in orchid collections until 1979 when Fred Thien Pe, a botanist from Yangon (Rangoon) University, arranged a trip to Kachin State in Northern Burma to search for it. After a fortnight of privations that included crossing treacherous terrain, wading fast-flowing rivers and a cuisine of jungle cat stew, Fred Thien Pe and three others eventually found a number of P. wardii plants either in bud or in flower.